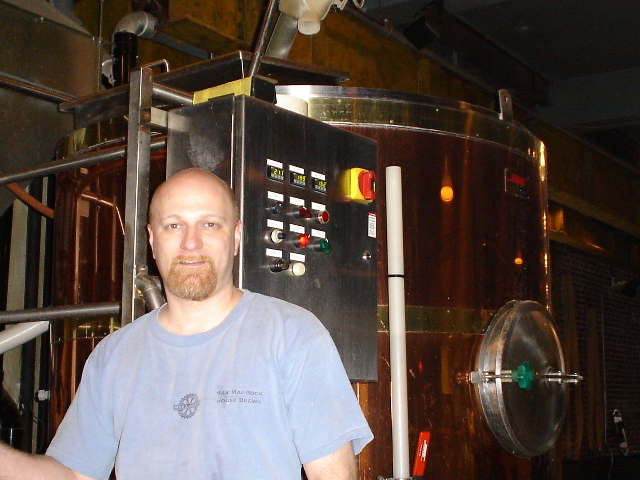 John Roberts is manager and head brewer for Max Lager's in downtown Atlanta. There is no better place to find fresh beer than a brewpub. There is no better place to find fresh beer than a brewpub. Brewpubs are restaurants that have a small brewery on site, and a range of house beers is produced to accompany the menu items. Most brewpubs offer a sampler tray with all their beers presented in 4-5 ounce glasses. Traveling beer lovers find great joy in seeking out new brewpubs in which to sample the edibles and the range of indigenous beers while admiring the gleaming (yet small) copper brew kettles. This article is a guide to the Georgia brewpubs that are in easy range (for your designated driver) from Athens. Copper Creek Brewing Company, 140 E. Washington Street, Athens (706) 546-1102. The regulars at Athens’ only (and much beloved) brewpub will provide many reasons for their unwavering loyalty. Some say that the unique, delectable (yet affordable) food is the real draw, while others sing praise to the sociable atmosphere of the place. The majority of folks sitting at the beautiful penny-covered bar will tell you that it is the talents of brewer Matt Buley that make this brewpub special. Matt rotates four house beers on a regular basis and does an outstanding job in handcrafting flavorful ales and lagers that include a Nut Brown Ale, Belgian Blonde, American Pale Ale, Oatmeal Stout and a German Kolsch ale. The pub is only open for dinner and offers discounts on house pints until 7 PM (and all day on Tuesdays). 5 Seasons Brewing Company, 5600 Roswell Road, Prado Shopping Center, Atlanta (404) 255-5911. The most popular slogan of beer lovers across Atlanta seems to be, “Meet me at The 5!” Because of its personable owners and staff, spacious main bar and dining area, gourmet menu that fuses European and Japanese foods, and outstanding hand-made selection of beers, 5 Seasons is considered by many to be Atlanta’s best brewpub. The kitchen prides itself on its use of organic produce and fine cuts of meat. Head brewer Glen Sprouse churns out a delightful lineup of beers that includes Seven Sisters Münchner (a slightly sweet, amber, Bavarian lager), Munich Helles (a light German-style beer that is similar to pilsner), and an ever-changing assortment of seasonal and specialty ales. The brewpub’s annual Oktoberfest celebration, which includes unlimited German food, beer and music for one price, is a mainstay on the social calendars of Atlanta beer aficionados. Gordon Biersch, 848 Peachtree Street NE, Atlanta (404) 870-0805. Located near the Fox Theater in Midtown Atlanta, Gordon Biersch is part of a nationwide brewpub chain that specializes in upscale food and European-style lager beers. Lagers are fermented for long periods at very cool temperatures and are malty, clean, crisp and satisfying. The Gordon Biersch lineup includes favorites such as a sweet Blonde Bock, a toasty Marzen (Oktoberfest beer), a caramel-like Dunkel, a spicy Pilsner and a cloudy Hefeweizen wheat beer. The cuisine is considered by many to be some of the most luscious brewpub fare available, and although the menu shows a heavy Asian influence, the big platter of garlic fries is the best selling food item. Max Lager's American Grill & Brewery, 320 Peachtree Street, Atlanta (404) 525-4400. One of Atlanta’s best-known brewpubs can be found in an attractive, old brick warehouse on Peachtree in the heart of downtown. Max Lager’s head brewer John Roberts’ lineup of beers includes Max Pale, Max Gold, Max Red, Max Black, and impressive seasonal beers brewed at appropriate times of year. Max Pale is an India Pale Ale brewed with generous amounts of spicy, citrus-like hops from the Pacific Northwest. Max Gold falls into the Bohemian Pilsner style and boasts a medium body and rich golden color. The Max Red is a malty Vienna-style lager with a mild blend of a rich toasted malt character and a subtle hop finish. The Max Black has a smooth, clean flavor of chocolate malt with a hint of coffee notes. Burgers, sandwiches and salads highlight the food menu, and the wood-fired pizzas are a favorite of the regulars. Park Tavern Brewery, 500 10th St. NE, Atlanta (404) 249-0001. After a stroll in Piedmont Park there is nothing better than a craft beer at this Atlanta brewpub. The huge back patio overlooks the park and offers thirsty patrons brews such as Druid Hills Pils, Park Trail English-style Ale, Olmsted Amber (named for the designers of Piedmont Park) and the dark Piedmont Porter. If raindrops are falling on your head, then go enjoy the rainy day $1 pint specials. Park Tavern also houses a spacious meeting room for wedding receptions and social gatherings. Rock Bottom Brewery, 3242 Peachtree Road, Atlanta (404) 264-0253. Four brewpubs could be found in Buckhead in the late 1990s, but now only one remains. Rock Bottom is located at Peachtree and Piedmont near Lenox Square Mall and is quite popular with the young, professional crowd that unwinds there after work. Rock Bottom brewpubs can be found all across the nation, but the Atlanta location stands out mainly due to the excellent quality of the beers produced by brewer Jamie Rowe. Jamie’s Loop India Pale Ale is strong, bitter and aromatic, and the award-winning Sweet Magnolia Brown Ale is a slightly sweet beer with hints of roasted nuts. Rock Bottom also features many unique seasonal beers throughout the year, and their brick oven pizzas and smoked chicken enchiladas are scrumptious.